I’m a big fan of fajitas but I’m also a little picky; boring just won’t do! 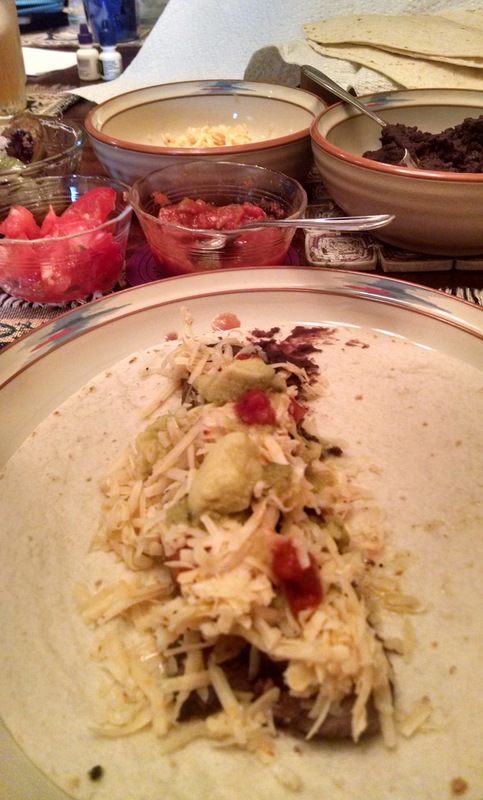 For mine, I like refried black beans, lots of cheese, salsa, and avocado. The meat (whether it be chicken, shrimp or steak) should be marinated and grilled to perfection. I also usually marinate strips of bell pepper and onion and turn them quickly in a hot skillet. You want them to still be a little soft but have a snap when you bite into them. My marinade recipe is absolutely delicious. It goes well on meat and veggies and mushrooms. Give it a try for your next culinary trip south of the border. Combine all the ingredients into a zip top bag and mash together to mix. Dump in shrimp, veggies, mushrooms, chicken or steak. Marinade in the refrigerator for at least one hour and up to six. 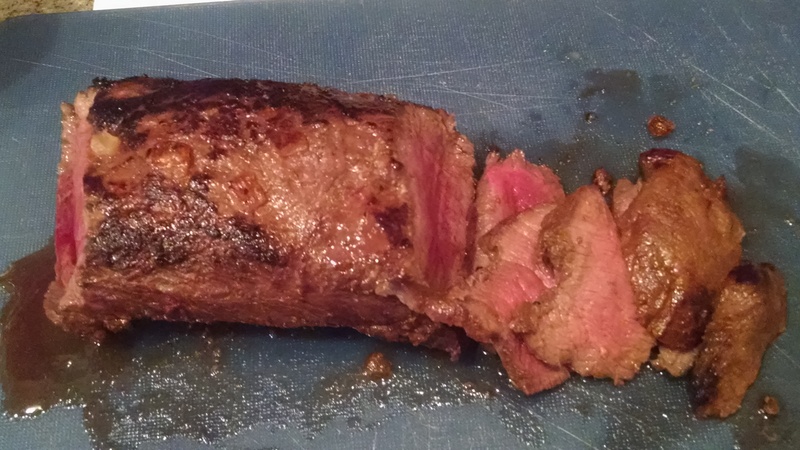 I used venison steak this time (about 1.7lb). Isn’t it pretty? March isn’t just Women’s History Month. It is also Women in the Military History Month. Women have been in combat in all our wars, including the Revolutionary, Civil and both World Wars, although some women dressed as men and used aliases. In 1776, Margaret Corbin fought and helped defend Fort Washington during the Revolutionary War. She was the first woman to serve and she was also the first to receive a pension for her service. Deborah Sampson Gannett enlisted under the name of her deceased brother, Robert Shurtliff, in 1782. For three years, Sampson served in the Continental Army and was wounded twice. To avoid detection, she cut a musket ball out of her own thigh so they would not find out she was a woman. At the end of the hostilities, her secret was discovered. She was given an honorable discharge by George Washington. Private Cathay Williams was the only documented woman known to have served in the U.S. Army as a Buffalo Soldier. On November 15, 1866, she enlisted in the Army as a man. Williams reversed her name William Cathay and lived as a male soldier. She served until she was found out due to the last of many illnesses she had suffered while serving. During World War I, the U.S. Navy and Marine Corps allowed women to enlist. More than 12,000 enlisted and about 400 died during the war. In World War II, a total of 350,000 women served in the U.S. military. More than 60,000 women served as Army nurses and over 14,000 served as Navy nurses. Today, women make up around 14 percent of the U.S. military. More than 165,000 women are enlisted and active in the armed services with over 35,000 additional women serving as officers. In honor of them, I’m using my special camouflage cupcake papers to make Lemon Blueberry Cupcakes (the blueberries look a bit red against the yellow cake to signify the ultimate sacrifice so many of the women made). 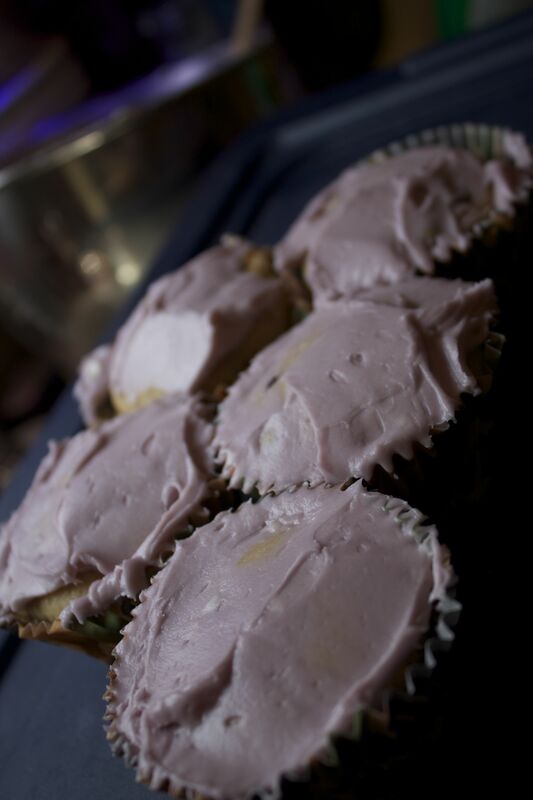 The pretty color of the frosting came by adding some blueberry extract, as the cupcakes are for the upcoming Board meeting of the Forum for Equality, a statewide LGBT rights organization here in Louisiana. Preheat the oven to 350F. 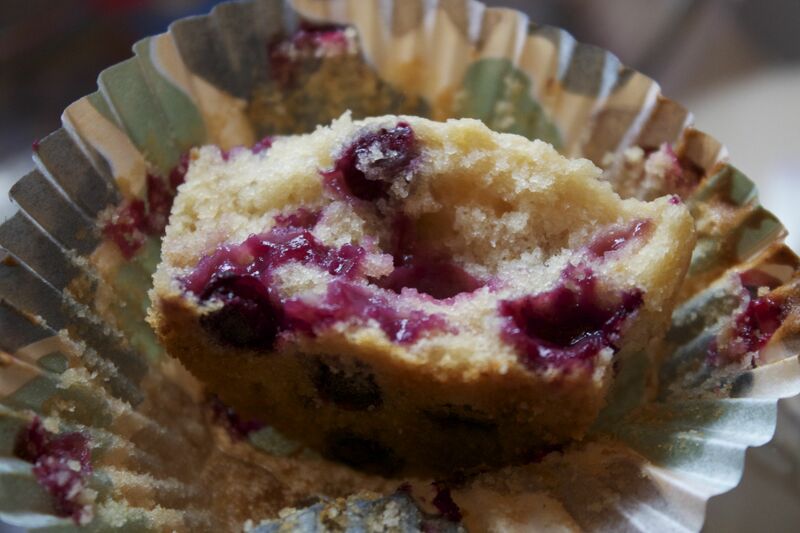 Put cupcake wrappers into muffin tins. Makes around 30 cupcakes. Set aside. In a large sized bowl, sift together the flour, baking powder, and salt. Beat the butter and sugars on medium-high speed until creamed, about 2-3 minutes. Scrape down the sides and bottom of the bowl before adding eggs and vanilla. Beat on medium speed until everything is combined. Scrape down the sides and bottom of the bowl as needed. Slowly add the dry ingredients to the wet ingredients. Drop the speed to low, then add the milk, lemon zest, and lemon juice. Remove from the mixer and stir lightly until everything is just combined. 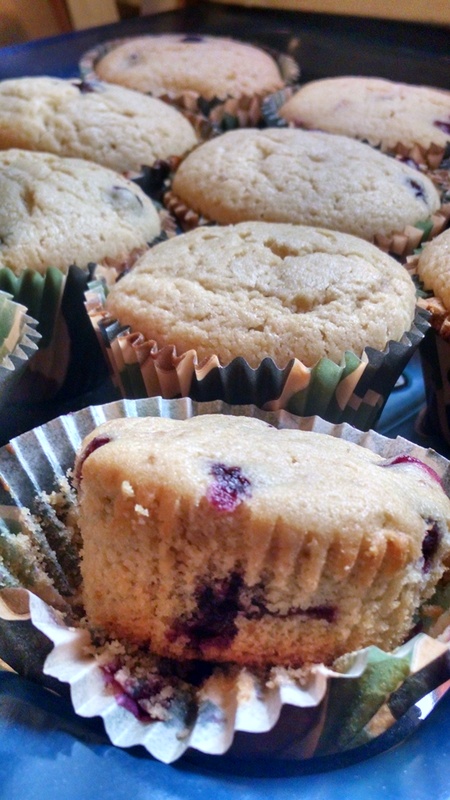 Toss the blueberries in 1 tablespoon of flour and fold into the batter. Batter will be very thick. Spoon batter evenly into cupcake wrappers. Bake for about 20-25 minutes or until a toothpick inserted in the center comes out clean. Switch pans front to back and left to right about midway through cooking. Remove the fully baked cupcakes from the oven and allow to cool completely before frosting. For the frosting, beat cream cheese and butter together on medium speed until creamy and without lumps. Add confectioners’ sugar, cream, vanilla extract (or blueberry extract, if using), and salt with the mixer on low. Increase to high speed and beat for 3 minutes. Add one more tablespoon of cream to thin out, if desired. The recipe doesn’t make a ton of frosting, just enough for a light frost. Top with blueberries, if desired. I’ve been to Elizabeth’s Restaurant for breakfast and for lunch so tonight I took some of my fellow authors from the Saints and Sinners Literary Festival there for dinner. The only real illumination seemed to be candles but the atmosphere encouraged the trading of secrets in the darkness. They started us with corn bread muffins and that just whetted our appetite for more. I ordered the fried chicken. 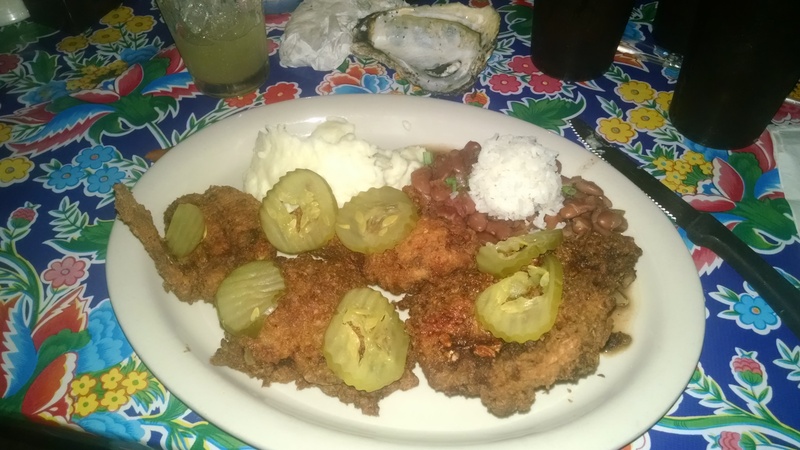 It came with pickles to add a bite to the tender meat and crisp coating. Definitely in my top ten for fried chicken in the city. The mashed potatoes needed a little gravy but were otherwise delicious. The red beans and rice were a touch bland but some hot sauce fixed that. 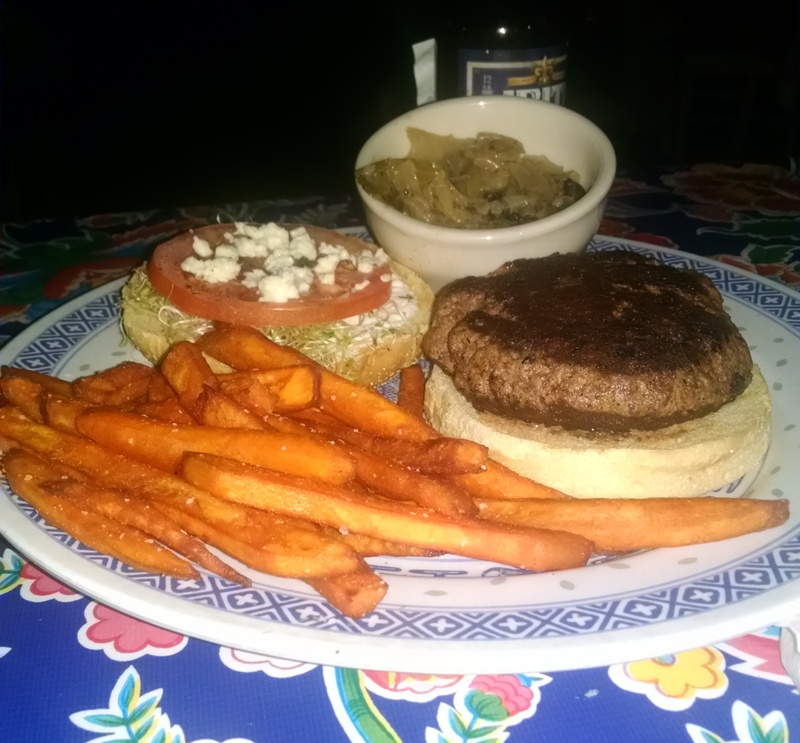 Marie Castle had the lamb burger. Cooked medium rare, it was juicy and well seasoned. 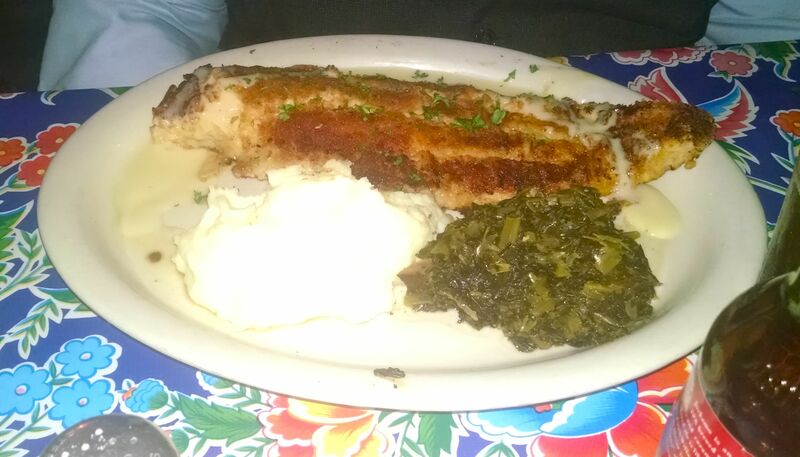 Cindy Rizzo had the catfish and it just melted in your mouth. On Facebook, she posted – “Best.catfish.ever. Loved it.” My pesky camera flash made hash of the mashed potatoes but, trust me it tasted a whole lot better than it looks in this picture. 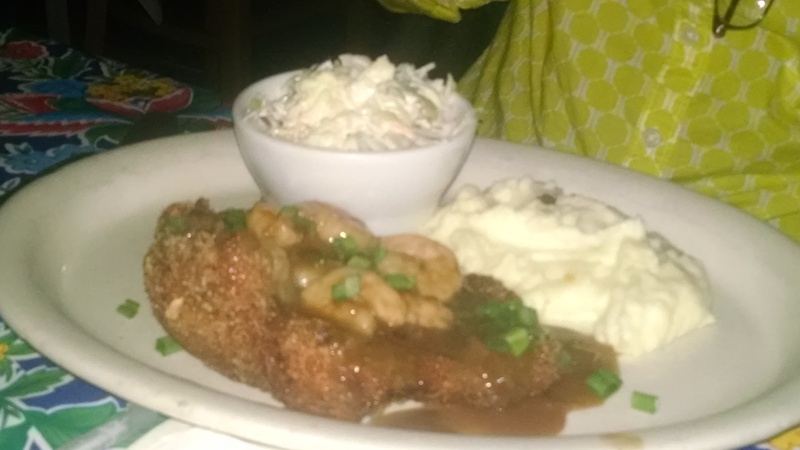 Lori Horvitz had the panned pork chop with brown gravy. Very well cooked chop and the gravy was lip smacking good. Again, the picture I took doesn’t do justice to the plate. I really enjoy my visits to Elizabeth’s. The food isn’t pretentious; it is just really good. The walls are covered with art from Dr. Bob (famous for those Be Nice or Leave signs you see about town), the staff is friendly and they don’t rush you. So give yourself a gift and get over there soon. Your taste buds will thank you. 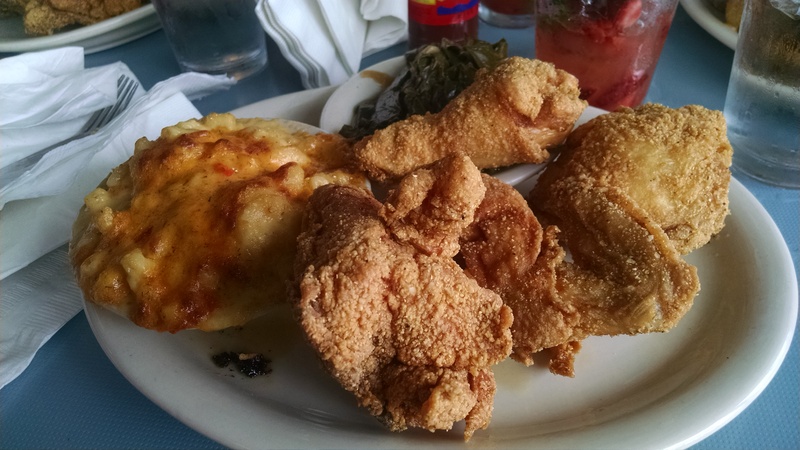 Deanie’s Seafood in the French Quarter is located near the Canal edge of the Vieux Carre. It is also just a couple of blocks from the Hotel Monteleone where I was spending the weekend at the 12th Annual Saints and Sinners Literary Festival. 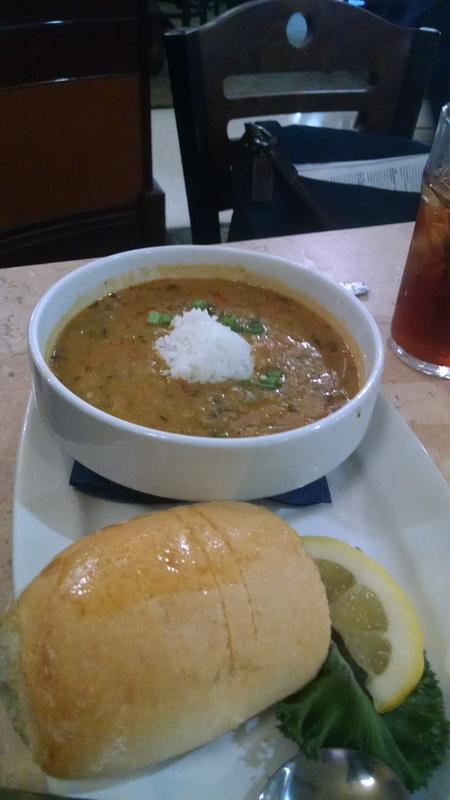 While the prices are French Quarter average (which translates to high), the seafood is Louisiana wild and the menu fairly extensive with traditional New Orleans seafood dishes. 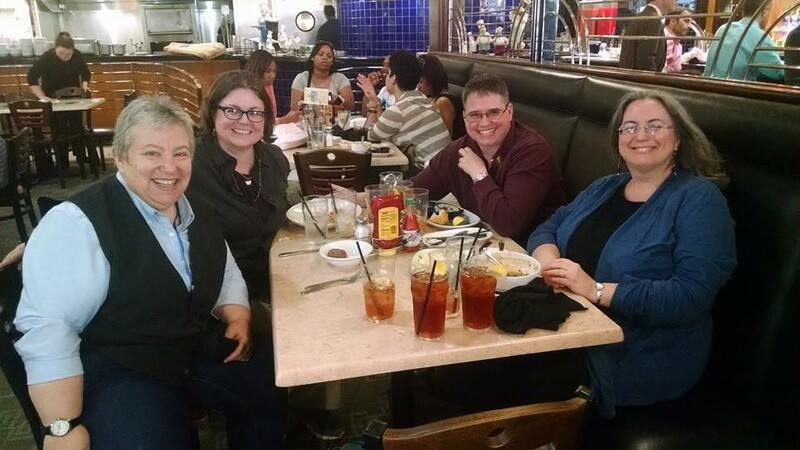 I went with three writerly friends from the conference and we enjoyed a delicious meal and lively conversation between the panels and readings. Instead of starting us with bread, they brought freshly boiled potatoes from the crawfish boil to the table. Lightly spicy, they were a good way to begin the meal. 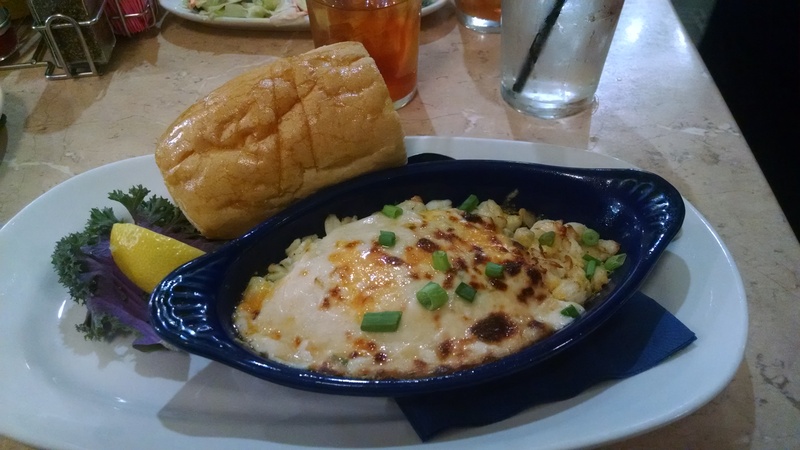 I had the crab meat au gratin. A lot of crabmeat in a cheesy blend, it was almost as good as Mama makes. I only ate a bite or two of my salad before passing it on and the bread was either a little stale or lightly toasted, so not very conducive to soaking up the sauce. Marie Castle had the Bucktown boil pizza. 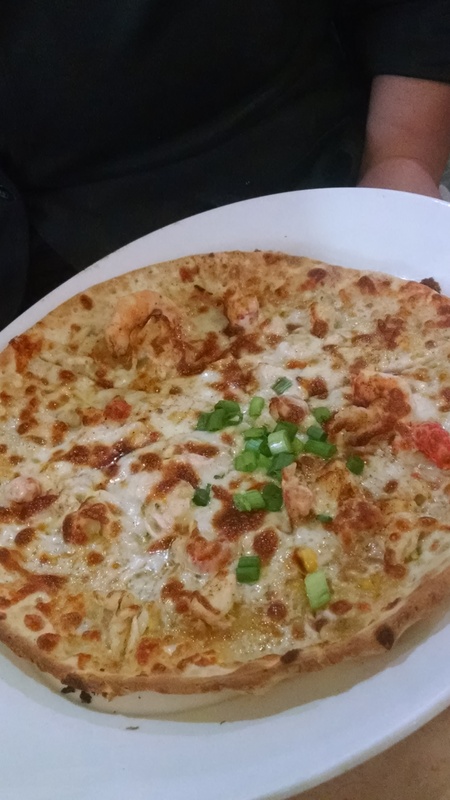 There was a time when I would have balked at having crabmeat, shrimp and crawfish on a pizza but this was a delicious melange of flavors on a thin pizza crust and what could be better? It was a little salty but also a lot good. Catherine Lundoff and Cindy Rizzo both got the crawfish etouffee and they were proud members of the clean plate club by the time the meal was over. Is there really any higher compliment? We were there at lunch and the place was very busy and noisy, however the expected twenty minute wait only took about ten minutes before we were escorted to our seats. The staff was fast but friendly and refills were brought without asking. As you can see we were all smiles at meal’s end. It is a beautiful spring day in New Orleans so we decided to drive along Magazine Street to find a place for lunch. 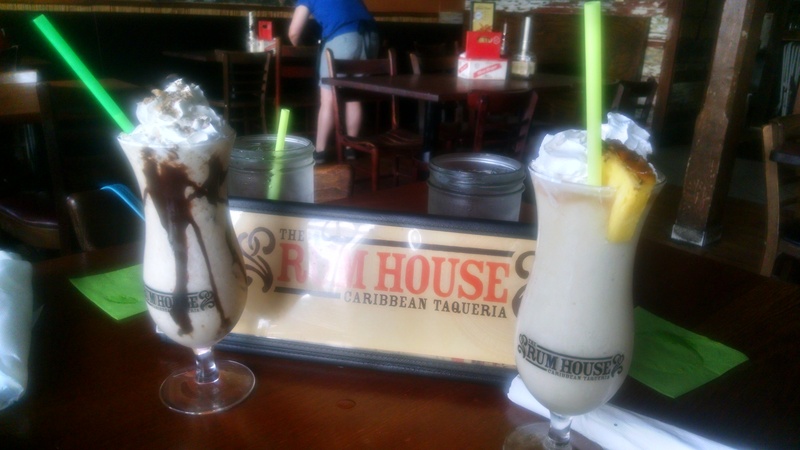 We came up on The Rum House- a Caribbean Taqueria and it was a no brainer to stop for a drink and a bite. We started with a Pina Colada and a Funky Monkey (Fresh banana, Cruzan Dark Rum, Kahlúa, Cream of Coconut, Crème de Cocoa, cream, whipped cream, chocolate toffee flakes) and it was very much like dessert in a glass. They went really well with the Queso Blanco dip. 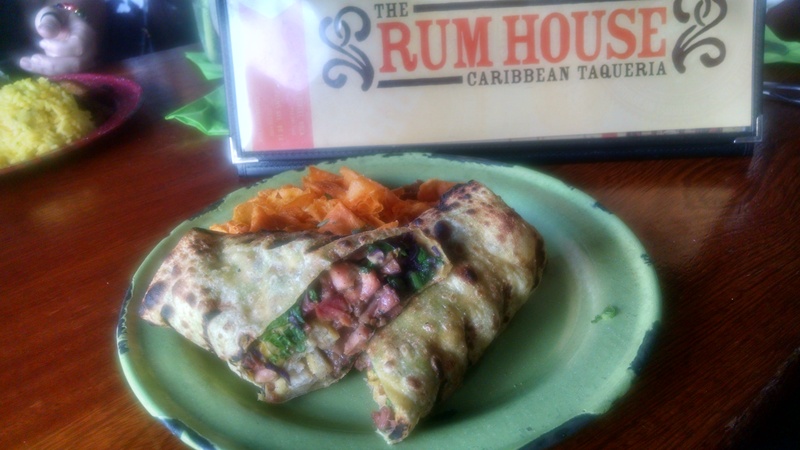 For my lunch I had the Trinidad Chicken Roti – a wrap with jerk chicken and a Trinidadian curry sauce. The sauce was good but it almost overpowered the chicken. It came with house made sweet potato chips that melted in my mouth. Delicious combo. Michelle tried two of their tacos – the selection is huge but she went with grilled Mahi-Mahi and the pork mole. 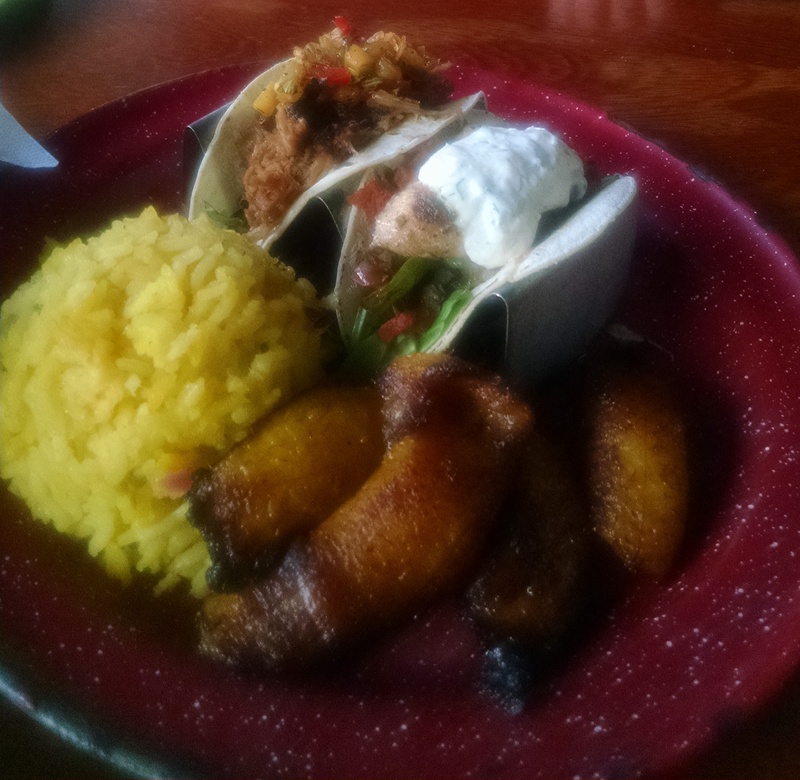 Very good, fresh flavors on both and went well with her side choices of coconut mango rice and fried plantains. Service was fast and friendly and the lively music had us tapping our toes. It did get a little loud as it filled up with the lunch crowd but you could still hear enough to converse. Definitely a place to revisit. They also do an Island Time happy hour from 3 to 6:30pm during the week, so that’s another reason to go back! 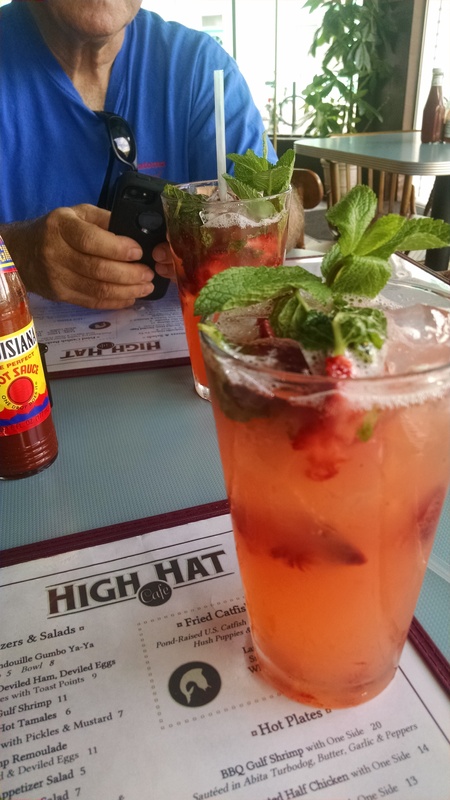 Michelle’s parents brought her down for a visit and we went out for some good southern cooking at High Hat Cafe on Freret. I started with a strawberry mint lemonade. Awesomely cool and refreshing! It was fried chicken day, so we were was very, very happy. They use a little cornmeal in their batter and the taste is excellent. Add to that pimento mac and cheese and you’ve got a combination to make your taste buds sing. Yes, I will confess that I didn’t touch the greens. The plate comes with a lot of chicken and everyone but I had some to put away for the lunch the next day. When going down the river, don’t get too close to shore as snakes might drop out of the trees onto you. Don’t let any blood get into the water or those alligators will overturn the boat to get at it (and you). I really recommend them – their menu is chock full of local delights done right.